This 4 bed, 3 bath, 3 CAR GARAGE home features a smart split bedroom floor plan. 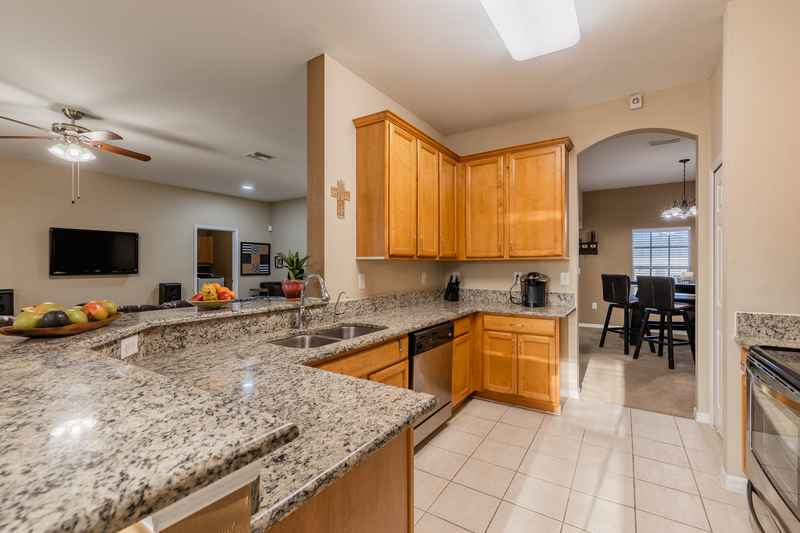 The granite counters are gorgeous in the kitchen, which opens up to an enormous living room (27′ x 17′) Perfect for entertaining or just hanging out as a large family. Volume ceilings in the living room make it feel even larger. The master is HUGE & offers a bathroom w/ dual sinks, private water closet, soaking tub & separate shower. The house offers another ensuite guest room – perfect for having overnight guests. The 3rd bath is accessible from the lanai (for your future pool) & is shared by the remaining 2 bedrooms. All the guest rooms offer plenty of space. Laundry room located in the house on the way to garage, which is HUGE- 28′ x 20′. The large, under truss & screened lanai is 23′ x 10′. The sellers have been taking great care of this house, including: New AC-2016, New well pump-2018, New water heater-2019, New R/O water filter system for the kitchen-2017. There is a Honeywell security system panel in the house, but the current owners have never used the system. The house has vacant land on both sides, giving you some breathing room from the neighbors.